Kirsten Brazier is a 1st grade teacher at a Title 1 school, Crawfordville Elementary School in Wakulla County, Florida. 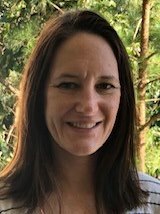 She is passionate about using the outdoors to engage students in learning and supports all teachers at every grade level in using Project Learning Tree’s lessons to connect children to nature. Kirsten encourages new faculty to attend PLT trainings and she organizes PLT Week, an annual event with a wide range of activities for all students and members of the community that is focused around a central theme to grow awareness of environmental issues in their area. Kirsten also plans and creates service-learning opportunities for students at her school and helps find funding. Students grow vegetables, herbs, and flowers in raised garden beds, they observe monarch caterpillars and butterflies attracted to their butterfly garden, and they set up a school-wide recycling program and participate in Recycle-Bowl, a yearly competition organized by Keep America Beautiful in which students track the amount of trash they recycle in a month. Kirsten received National PLT’s Leadership in Education Award in 2019. Kevin Doran, a natural science educator with the Maine Department of Agriculture, Conservation & Forestry, uses PLT as a cornerstone of his programs with children. Joan Chadde is the Education Program Coordinator at Michigan Technological University in Houghton, Michigan, where she also teaches a course called Communicating Science. Hazel Scharosch teaches grades K-6 at Red Creek Elementary School, a one-room schoolhouse in Casper, Wyoming, where she has led many PLT workshops.